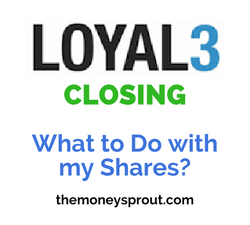 LOYAL3 is Shutting Down – What Should I Do With my Shares? One of my absolute favorite investing tools is shutting down its operations. Yes, LOYAL3 announced last week they were closing down. Effective May 22, 2017 – LOYAL3 will close. As many of you probably know, I am a big supporter of using zero cost brokers to build a dividend portfolio of stocks. I have been using both LOYAL3 and Robinhood for many years and have built significant positions in several stocks from both brokers. And in every single stock purchase, I have never paid any fee’s or commissions. I have made trades for as little as $10 in partial shares of stock through LOYAL3 on several occasions … which in part may be why they needed to close. Since I actively invest in stocks each month through LOYAL3, I will need to decide how and where to transfer these assets. Currently, approximately 28% of our assets in the Money Sprout Index are held in our LOYAL3 account. What Does this Mean for Account Holders? Current LOYAL3 customers were offered several options, listed below. Depending on the option(s) account holders decide on … they need to take action by around May 15th or 16th depending on what they decide. At first, I thought option #1 seemed to be interesting. According to LOYAL3, if account holders choose to take no action … their assets will be moved to a new FolioFirst account on May 22nd. FolioFirst offers free trades on several different stocks (probably more than LOYAL3). However, starting in August, account holders will be charged a $5 monthly fee. NOPE – not for me. Personally, there is no reason for me to pay this fee when I can continue using our Robinhood account. So option #1 is out for me. Plus, Robinhood offers shareholders the ability to invest in every single US Stock. I am sure FolioFirst cannot offer that. Option #3 is not appealing as well – sell current LOYAL3 shares and withdraw the cash. I certainly don’t want to let all our hard work go to waste building up positions in companies like Microsoft (82+ shares) and WalMart (53+ shares). We have no desire to cash out of the shares we have been working every month to acquire. So our plan is to go with option #2 – but modified. We plan to transfer all of our whole shares (or at least most of them) to our existing Fidelity brokerage account before May 15th. Note – you cannot transfer partial shares … so either you need to sell them before the transfer or LOYAL3 will do it for you. One of the things I always liked about LOYAL3 was that we could throw $25 or $50 per month into a stock that we may not have otherwise invested in. Unlike Robinhood, LOYAL3 allowed investors to purchase partial shares with a minimum purchase of $10. Similar to a direct stock purchase plan, this allowed us to invest $100 a month in Apple (AAPL), or $25 a month in Dr Pepper Snapple (DPS), or $50 in VF Corp (VFC). In each case, those funds were not enough to cover the full price of 1 share of stock. But by allowing partial share investments with no fee’s, we were able to start adding a little bit each month. This allowed us to diversify into more companies than we originally would have. And it allowed us to dollar cost average into companies like Apple (AAPL) and Target (TGT). Now that LOYAL3 is closing and we are moving our assets into a Fidelity account, we need to rethink this strategy. For example, we owned 1.97 shares of Dr Pepper Snapple (DPS) as of last week. We just started investing $25 per month in this company not too long ago and planned to keep that going. But now, if these assets (even rounding up to 2 shares) were moved to a Fidelity account … I doubt we would do anything with them. We likely wouldn’t add any new shares for a while … based on paying commission. And we certainly wouldn’t want to sell 2 shares and pay those commissions. So … we have decided to take an inventory of the shares we want to transfer and those that we no longer want to keep. We are starting to sell off shares in several companies (DPS, K, KHC, and VFC) that we owned fewer than 10 shares in and had no intentions of making large lump sum investments in the future. In addition, we are selling off all partial shares of stock (KO, INTC, MCD, MSFT, UL, and WMT). The funds from these sales will then be reinvested back into new shares of stock (AAPL, BBY, and TGT) to try and get more whole shares. Sounds like a bunch of work that isn’t really worth it. But it gives us a chance to audit our shares and clean up the account a little. One last item … we thought about transferring all these shares into our Robinhood account instead of Fidelity. But that still doesn’t solve the problem of partial share investing. The good thing about our Fidelity account, is that we can start using dividend reinvestment on our larger holdings now like MSFT, WMT, and TGT. Once we clean up our LOYAL3 account and moved forward with the transfer, I will follow up with a status of the process. Are you a LOYAL3 account holder? What do you plan to do with your assets once the platform is shut down? Full Disclosure – At the time of this writing, we owned shares in the following stocks noted in this post – AAPL, BBY, KO, INTC, MCD, MSFT, TGT, UL, and WMT. The material above is not a recommendation to buy. Please do your own research on a company before deciding to invest.